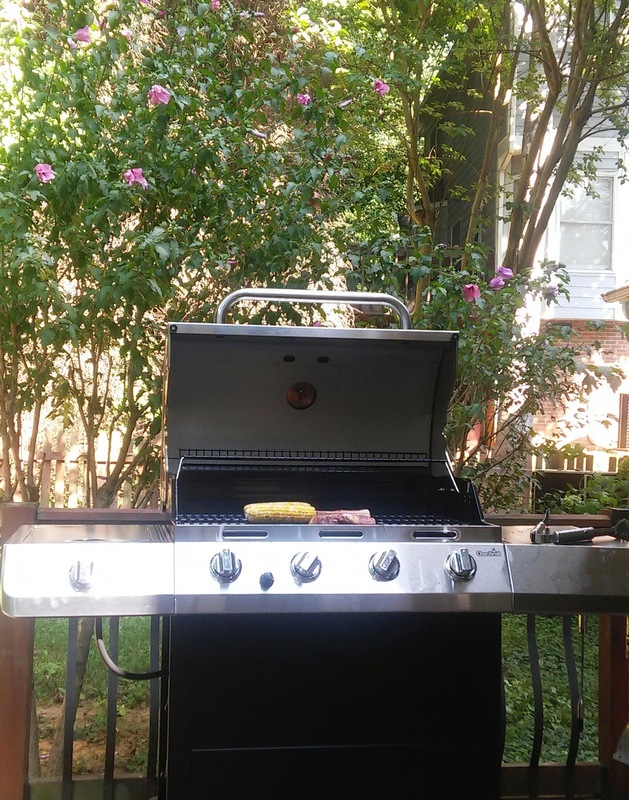 The new grill and its majestic floral backdrop. I don't know if it was low cost of entry, an innate, caveman instinct in my brainstem towards building a fire, or really effective marketing from Kingsford, but I've always considered myself a charcoal griller. My tailgate lot start began with with a fold out Wal-Mart unit that set me back just a couple of Hamiltons, but Old Faithful was put out to pasture after over a decade of use a few months ago, having been replaced two years ago by a walkabout propane model just in time for tailgating DCI Championships in 2014. That one became the home grill for a bit after my home charcoal model didn't make the move a year ago. But now, the beaut you see here is the new home model. Purchased this summer and up and kicking in time for a Fourth of July party, I've since become decently proficient, if I do say so myself. I actually gave it a trial run before having folks over for the 4th; after all, with limited gas experience, I had to make sure I knew what I was doing. Turns out I had nothing to worry about; if anything, I took a step down in difficulty switching to propane. While I've often been the sort to fire up the grill frequently, there's something to be said for the easy on, easy off of gas. I'm not hauling this bad boy to the tailgate lot anytime soon, but it'll be the face of homegating from here on out.